Committee: Victor Watterson, Enda Clerkin, Brendan Askin, Aiden McMeel, Breige Downey, Barry Sherry. 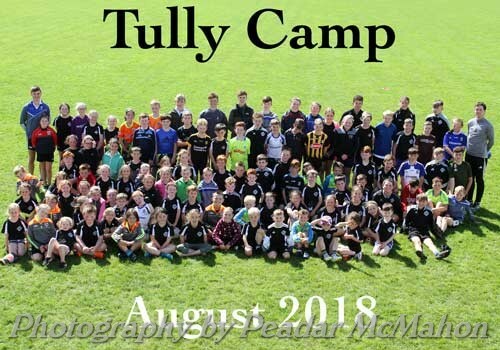 Tully GAA Summer Camp finished up last Friday and we had our biggest attendance ever with 110 children participating throughout the week, well done to all the boys and girls who took part in the Camp we hope you all had an enjoyable week. A big thanks goes to Leoina Kelly for her work in organising this event and to all the coaches Gareth McQuaid, Aine Mohan, Jonathan McCarron, Ben McKenna, Helen McNally, Ben Ryan, Karl Gallagher, Eoin McKenna, Cameron Liddle, Hannah Finn, Brid McNally & Luke Kelly and everyone else that helped out with registration. See below. U7 and U9 training will take place on Friday evening as usual from 6-50 - 8pm. Well done to all the U9 players who played in the blitz at Eire Og grounds last Wednesday evening, it was great to see so many players turn up and play so well. Thanks for Eire Og for the invitation. U11 training will continue on Thursday evening from 7 - 8pm. Well done to the U11 panel who were kindly invited to the Mick Farrell Tournament at their grounds on Saturday. U13 team took the field in Clones for the Under 13’s Division 3 League Cup final where they played Killanny. In a tense first half both teams cancelled each other out with Killanny scoring a second goal just before half time to go in at the break 2-03 to 0-05 for Emyvale. Starting the second half four points down Emyvale got a goal from Matthew Finn to reduce the margin to a single point and they were back in the game. Both teams traded scores throughout the second half with Emyvale eventually building a 3 point lead with five minutes left on the clock, Killanny had a late rally scoring three point in a row to make it all level with only moments remaining. In a break up the field Aidan Treanor found Matthew Finn with a slick pass who quickly released it to Kayden Keenan who after a fantastic run from midfield buried it to the net scoring a last gasp goal and the game finished Emyvale 4-08 Killanny 3-08. This was a fantastic game with the result seeing our U13's be crowned double winners having already won the Championship earlier this year. Their double winning performance as well as a win in the U13 Division 6 shield final rounded off a very successful season year for this bunch of young boys and their mentors. A big word of thank to the Senior Executive for presenting the team with half zips on Friday evening. U13 division 6 team travelled to Clogher on Saturday morning to take part in a tournament, well done to all who took part and a big thank you to Clogher for the invite. U-15 Division 1 Shield Final will take place this evening Thursday 30th August in St Mary's Park, Scotstown at 6:30pm when we take on Monaghan Harps. Please come along and support the team and their mentors, best of luck everyone and hopefully the players and mentors will come home with the silverware. U-17 league Division 2 commenced last Sunday morning in Toome for Emyvale when we took on Clan na Gael. In what was a competitive match Emyvale lost on a score line of 3-10 v 1-10, but it was a good showing for our boys on their first run out. Matches will be coming thick and fast over the next couple of weeks with Emyvale playing Eire Óg in the U17 Div 2 Championship 2018 Championship Q/F in St. Oliver Plunkett Park on Sunday 2nd Sept at 11am. This will be following the followed on Sunday 9th with Emyvale against Magheracloone in the Div 2 league again in St. Oliver Plunkett Park 11am. Seniors recorded another win in the JFC on Wednesday last against Clones. The boys were made work right to the end and a goal by Colin Hughes sealed the victory. We were leading at half time At the end of a 1st half where Emyvale capitalised better on the chances that came their way they led by 2-5 to 0-6, with the goals coming from Gavin McKernan, and Daniel McMahon. Clones however responded in the second half and started to mount a comeback. The team were resilient and dug deep to ensure the victory. Well done to all. They now play Killeevan this Saturday in Scotstown with a throw in time of 16.15. Come along and support the lads. Teams and Scorers: Gerard McCaffrey, Sean McMeel, Aaron Loughran, Ciaran Connolly, Ryan Kelly, Gregory Devlin, Ryan McAnespie 0-1, Michael Flannery, Colin Hughes, 1-0, Stephen Askin, Robbie McAllister, Gareth McQuaid 0-3 (3f), Paul McCarron, Gavin McKernan 1-0, Daniel McMahon 1-5 (0-2f). Subs: David McAlister 0-1 for Michael Flannery, Michael O'Brien for Stephen Askin. BC Blitz, keep free Saturday 15th September when we run our annual U11 BC Memorial Tournament because a lot of help will be required on the day. Good luck to all our gaels starting primary and secondary school this week, we hope you settle in well. Emylott Result Jackpot: €2100. No winner. No match 3's . 5 Lucky Dip winners. Emily Brennan Ballinaman, Kevin & Patricia Mc Kenna Mullaghbrackscott (yrly), Rita Mc Quaid Moybridge, Colin Mc Areavey Dernashallog (yrly), Micheal Mulligan Termonfeckin. Promoters:- Niall Mc Kenna & Maebh Mc Nally. Yearly Promoter:- Mickey Mc Carron. Numbers drawn 15, 16, 17, 18.